“Use Siri app to open Photos or other apps on your iPhone, then quit the app and then open the home screen and you will have bypassed the iPhone lock password”. Does this really work? it does not matter the number of attempts you make; Siri will always ask you to enter a passcode for you to be able to access other apps on your iPhone. So, if you thought that tricking Siri or using Siri can enable you to get into a locked iPhone, you should know that you will not be able to. If you want to get into an iPhone without using Siri app, you need to use iMyFone LockWiper (Win & Mac). 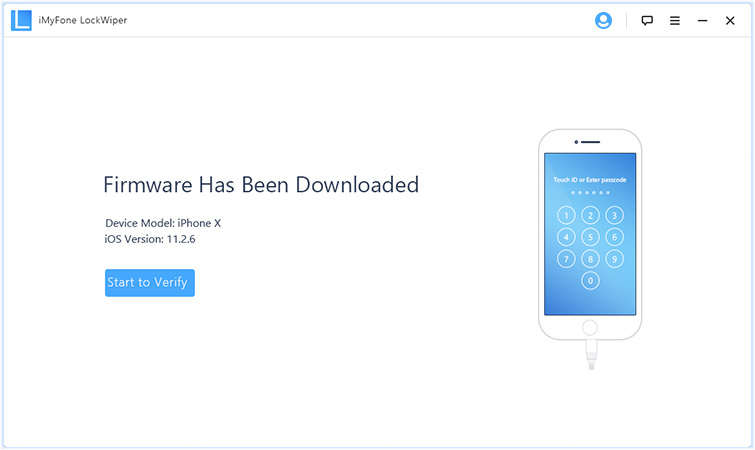 It is a professional iPhone unlock tool that is convenient, easy to use and the most reliable software on the market today. This tool can help you remove screen lock on your iPhone, bypass the 4 or 6-digit passcode, Touch ID as well as Face ID on your iPhone. In a matter of minutes, you will be able to use your device once again. Before we look into the steps on how to use this tool, it is essential to point out that your device will be erased after the process is complete and your old iOS version will be updated to the latest version. Step 1: Download, install and launch LockWiper on your personal computer and then click on Start for the process to start. Step 2: Connect your iPhone. 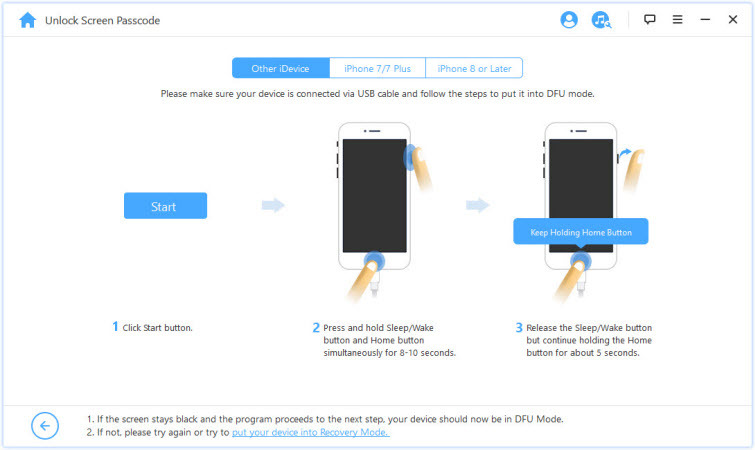 choose the model of your device on the program’s interface and follow the guide to put your device into DFU mode. 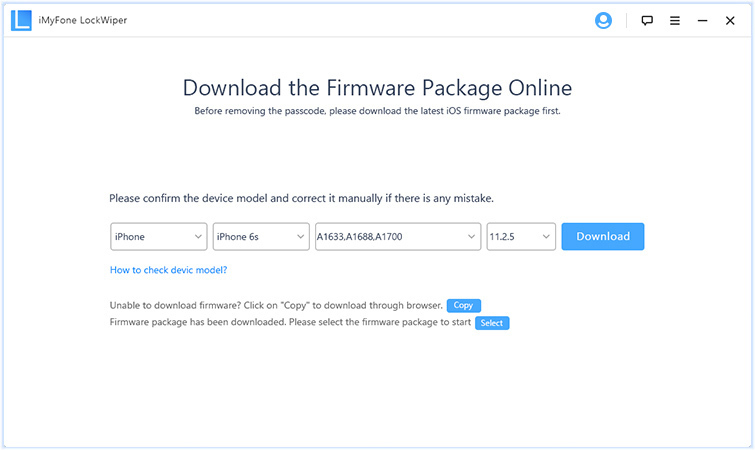 Step 3: Once your device will be in DFU mode, the tool will detect your device and prompt you to download a firmware package for your device. But before proceeding with the download, ensure that the name and model of your iPhone is the right one. Then click on Download. Step 4: Click on Start to Verify once the firmware has been downloaded successfully. 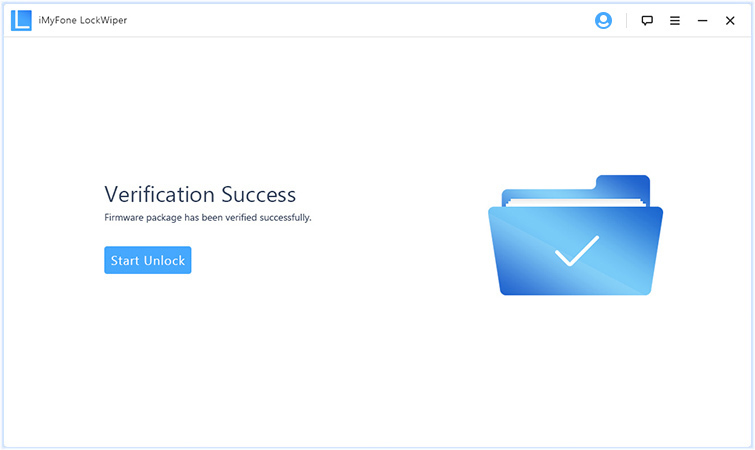 Step 5: After the verification process, click on Start Unlock. Step 6: A pop-up window will appear requiring you to enter a code. Enter 000000 as the confirmation code for the tool to initialize the unlocking process. The unlocking process will start and you will be notified once it is complete. This will take a few minutes to complete. There are other ways that can enable you to get into a locked iPhone without Siri. Although these other methods will let you gain access to your device, they are not as effective as using iMyFone LockWiper tool. They are long, take more time and can even fail sometimes. Using Find My iPhone feature under iCloud, you can get into a locked iPhone. However, for this method to work, you must activate the Find My iPhone feature. Using a computer or another iDevice, go to iCloud.com. Sign in to your iCloud account using your Apple ID and password. Click on All Devices found at the top of the browser window. Choose your locked device from the list. Click on Erase iPhone button to remotely erase your device and its password. Your iPhone must have an internet connection. You must know your iCloud account and password. If you have synced your iPhone with iTunes previously, you can use iTunes to get into your locked device without losing your precious data. However, you will need to have the specific computer that you used to sync your device with an updated iTunes version on your PC. Connect your iPhone using a USB cable to a computer running an updated iTunes version. iTunes will automatically detect your device and it will start to sync and backup the device. When it’s done, click on the Restore iPhone button under the Summary menu. Wait for the process to complete and then set up your iPhone once again. You can restore the backup files from iCloud or from the particular backup you have used to restore all your data files. You must have synced your iPhone recently. If any password is required during the process, this way is not available for you. 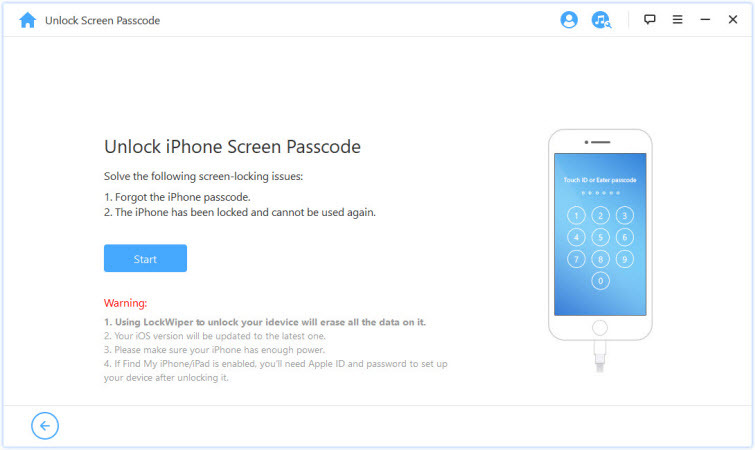 Getting into a locked iPhone without Siri is possible thanks to iMyFone Lockwiper. It is the easiest, fastest and most reliable way of removing screen lock on your iPhone. In fact, it is highly recommended by tech experts and has the highest success rate as far as to access a locked iPhone without a passcode is concerned.